Treehouse. Looking at the word or reading it outloud is enough to make most people’s faces light up. What is it that is so enticing about treehouses? When I put this question to Pete Nelson, owner of The Treehouse Workshop and lifelong tree lover, he replies that, for him, the captivation comes from the idea of a treehouse representing one’s own space and independence. Part of the appeal of having a treehouse, he continues, is the automatic attraction to the tree itself, the ‘fantastic being’ that it is and the conscious or subconscious sense of security that it provides. As I begin to read ‘Treehouses,’ one of the many books that Pete has penned on the subject, I realize that there is a possibility that we have an inborn desire to be in a tree--our ancestors once inhabited trees and our childhood memories of treehouses play a large part in our current captivation. 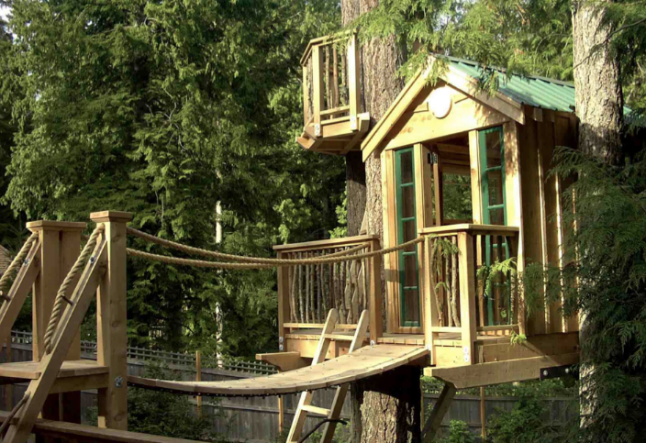 In addition to some of us owning treehouses or playing inside a friends’ at a young age, almost all of us were witness to a number of treehouses through television and books--most notably in Swiss Family Robinson, Tarzan, and Winnie the Pooh. 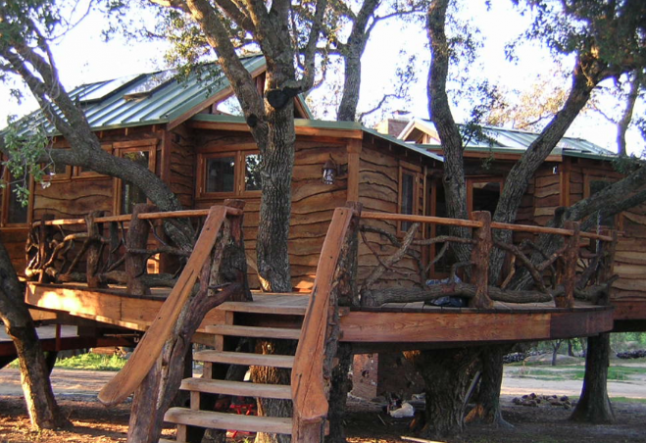 Regardless of the reason why we are drawn to treehouses, it seems safe to say that across the board, treehouses represent an escape of sorts--be it from a flood, an enemy, earthbound responsibilities, or grown-ups. Some of the earliest treehouses were constructed during the reign of the Roman Emperor Caligula and during the Italian Renaissance by the Medici. In the past, treehouses were most prominent in the South Pacific and Southeast Asia; today they can be seen all over the world. Pete believes that one of the greatest appeals of a treehouse lies in the fact that by building and living in one, you are treading lightly on the earth, or more poignantly, not leaving a footprint at all. There is no digging involved and no concrete required. “You go out with a drill and a pile of wood and you hang your beams and roll your joist and before you know it, you have a solid floor and you’re not even digging up roots.” Building a treehouse offers the opportunity to work with nature, rather than against it. The majority of materials used in construction are salvaged from buildings and found in junk or garage sales. 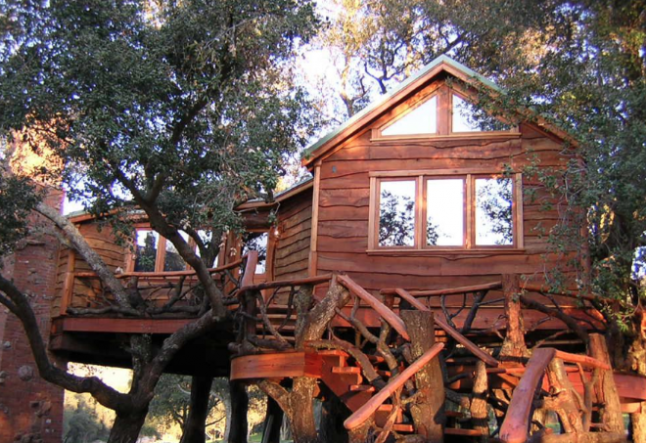 As a result, a treehouse can be built entirely out of reused and recycled materials, thus making for a sustainable and environmentally friendly home. Pete’s fascination with treehouses started at an early age. At six years- old, he had helped his dad construct a tiny treehouse in a maple tree behind their home. By age nine, he had populated his neighborhood with a string of little tree structures, but it was not until his mid- twenties that Pete begun putting his own ideas to work. Throughout high school, he had fantasized about a clubhouse of the highest stature, but abandoned the idea shortly after passing his driving test. As his late teens and early twenties unfolded, Pete found himself studying economics at college and doing some carpentry on the side. On one fateful day, however, an old, high school friend who had shared Pete’s passion, sent Pete a book on building treehouses. Almost immediately, Pete’s desire to build treehouses was rekindled. It started out small in his backyard, but it didn’t stop there. Pete continued to build and in 1992 he started The Treehouse Workshop, a treehouse construction company based out of Seattle. 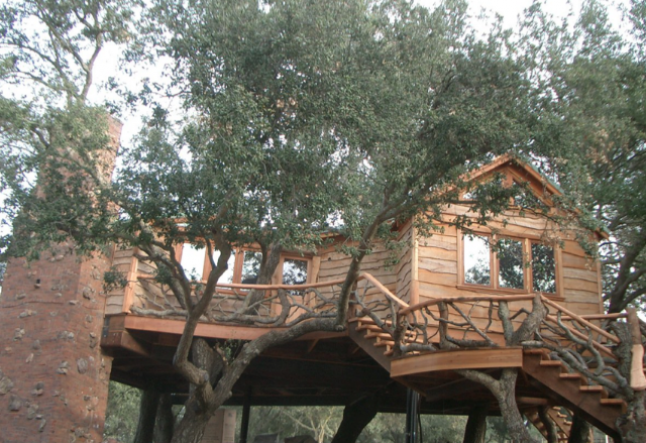 Today, the largest treehouse Pete has built to date is in San Diego, California; it is comprised of 950 sq. ft. in living space and 500 sq. ft. of deck space. It is also earthquake proof! Despite his accomplishments, one gets the impression that Pete continues to have a greater respect for the trees than the houses in them. Pete claims that it was in the midst of the Redwood Forest that the hair on the back of his neck stood up as he realized very clearly that “trees are definite beings with undeniable energy. You can feel their negative energy when they sense a logger or a drill,” he says. In the past, there have been projects where Pete has been convinced that a tree hasn’t liked what was going on. In such a case, Pete has learned from arborists that the best thing to do is to talk to the tree and to let it know what is happening. Before beginning construction of each treehouse, Pete leads a ceremony in which the tree is told that there may be a little pain, or “prick,” but that ultimately they are not here to hurt the tree, but rather, to enjoy it. Pete says that the fascinating thing is that trees react instantaneously to their wounds, automatically sending sap to the area that is hurt and compartmentalizing the wound. This he infers to be a true testament to the vibrant life force flowing inside these seemingly solid beings. These days, treehouses can be built for a number of purposes including an office, an art space or a home for the family and kids. 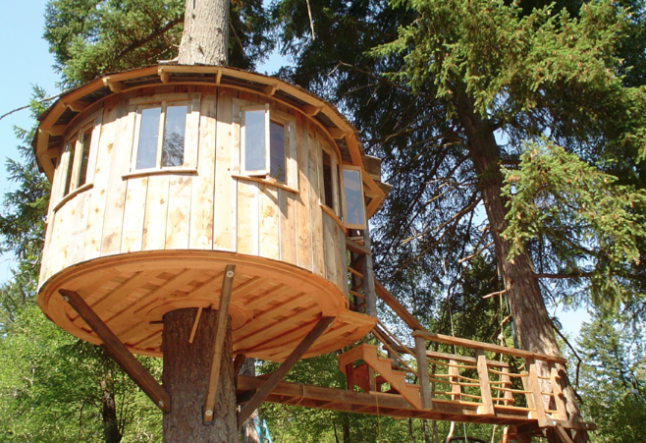 While the construction of a treehouse by a company such as Pete’s can be costly, The Treehouse Workshop offers workshops where you can learn to build your own tree home. So, with a little consideration for your neighbors and a building permit for anything over 200 sq. ft., you can have your own treehouse in no time.